Bưu thiếp "Gruss aus Hameln" mô tả Chàng thổi tiêu xứ Hameln, 1902. Chàng thổi tiêu xứ Hameln (tiếng Đức: Ratenfänger von Hameln) là một truyền thuyết trung đại xuất hiện sớm nhất tại thành Hameln năm 1300 và tồn tại tới nay qua nhiều dị bản chép tay. The rats of Hamelin. 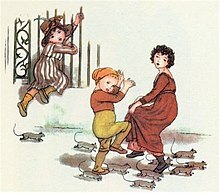 Illustration by Kate Greenaway for Robert Browning's "The Pied Piper of Hamelin"
The earliest mention of the story seems to have been on a stained-glass window placed in the Church of Hamelin c. 1300. The window was described in several accounts between the 14th and 17th centuries. It was destroyed in 1660. Based on the surviving descriptions, a modern reconstruction of the window has been created by historian Hans Dobbertin. It features the colorful figure of the Pied Piper and several figures of children dressed in white. This window is generally considered to have been created in memory of a tragic historical event for the town. Also, Hamelin town records start with this event. The earliest written record is from the town chronicles in an entry from 1384 which states: "It is 100 years since our children left." Although research has been conducted for centuries, no explanation for the historical event is universally accepted as true. In any case, the rats were first added to the story in a version from c. 1559 and are absent from earlier accounts. Năm 1284, thị trấn Hameln trải qua một trận dịch chuột, rồi bỗng đâu xuất hiện một ngâm du thi nhân đến gặp ông trấn trưởng và tuyên bố y xua được lũ chuột, nhưng với điều kiện là tòa thị chính phải trả y 1000 đồng vàng. Ông trưởng bèn chấp thuận, thế là y đem một cây tiêu ra hớp hồn bọn chuột và dẫn chúng ra sông Weser dìm chết. Một số phiên bản khác thay hình tượng chuột bằng trẻ em, sông Weser được thay bằng đồi Koppenberg hoặc dãy Transylvania hoang vu xinh đẹp. A number of theories suggest that children died of some natural causes such as disease or starvation and that the Piper was a symbolic figure of Death. Analogous themes which are associated with this theory include the Dance of Death, Totentanz or Danse Macabre, a common medieval trope. Some of the scenarios that have been suggested as fitting this theory include that the children drowned in the river Weser, were killed in a landslide or contracted some disease during an epidemic. Another modern interpretation reads the story as alluding to an event where Hamelin children were lured away by a pagan or heretic sect to forests near Coppenbrügge (the mysterious Koppen "hills" of the poem) for ritual dancing where they all perished during a sudden landslide or collapsing sinkhole. Added speculation on the migration is based on the idea that by the 13th century the area had too many people resulting in the oldest son owning all the land and power (majorat), leaving the rest as serfs. It has also been suggested that one reason the emigration of the children was never documented was that the children were sold to a recruiter from the Baltic region of Eastern Europe, a practice that was not uncommon at the time. In her essay "Pied Piper Revisited", Sheila Harty states that surnames from the region settled are similar to those from Hamelin and that selling off illegitimate children, orphans or other children the town could not support is the more likely explanation. She states further that this may account for the lack of records of the event in the town chronicles. In his book The Pied Piper: A Handbook, Wolfgang Mieder states that historical documents exist showing that people from the area including Hamelin did help settle parts of Transylvania. Transylvania had suffered under lengthy Mongol invasions of Central Europe, led by two grandsons of Genghis Khan and which date from around the time of the earliest appearance of the legend of the piper, the early 13th century. Among the various interpretations, reference to the colonization of East Europe starting from Low Germany is the most plausible one: The "Children of Hameln" would have been in those days citizens willing to emigrate being recruited by landowners to settle in Moravia, East Prussia, Pomerania or in the Teutonic Land. It is assumed that in past times all people of a town were referred to as "children of the town" or "town children" as is frequently done today. The "Legend of the children's Exodus" was later connected to the "Legend of expelling the rats". This most certainly refers to the rat plagues being a great threat in the medieval milling town and the more or less successful professional rat catchers. "After the defeat of the Danes at the Battle of Bornhöved in 1227," explains Udolph, "the region south of the Baltic Sea, which was then inhabited by Slavs, became available for colonization by the Germans." The bishops and dukes of Pomerania, Brandenburg, Uckermark and Prignitz sent out glib "locators," medieval recruitment officers, offering rich rewards to those who were willing to move to the new lands. Thousands of young adults from Lower Saxony and Westphalia headed east. And as evidence, about a dozen Westphalian place names show up in this area. Indeed there are five villages called Hindenburg running in a straight line from Westphalia to Pomerania, as well as three eastern Spiegelbergs and a trail of etymology from Beverungen south of Hamelin to Beveringen northwest of Berlin to Beweringen in modern Poland. Linguistics professor Jürgen Udolph says that 130 children did vanish on a June day in the year 1284 from the German village of Hamelin (Hameln in German). Udolph entered all the known family names in the village at that time and then started searching for matches elsewhere. He found that the same surnames occur with amazing frequency in the regions of Prignitz and Uckermark, both north of Berlin. He also found the same surnames in the former Pomeranian region, which is now a part of Poland. Udolph surmises that the children were actually unemployed youths who had been sucked into the German drive to colonize its new settlements in Eastern Europe. The Pied Piper may never have existed as such, but, says the professor, "There were characters known as lokators who roamed northern Germany trying to recruit settlers for the East." Some of them were brightly dressed, and all were silver-tongued. Professor Udolph can show that the Hamelin exodus should be linked with the Battle of Bornhöved in 1227 which broke the Danish hold on Eastern Europe. That opened the way for German colonization, and by the latter part of the thirteenth century there were systematic attempts to bring able-bodied youths to Brandenburg and Pomerania. The settlement, according to the professor's name search, ended up near Starogard in what is now northwestern Poland. A village near Hamelin, for example, is called Beverungen and has an almost exact counterpart called Beveringen, near Pritzwalk, north of Berlin and another called Beweringen, near Starogard. Local Polish telephone books list names that are not the typical Slavic names one would expect in that region. Instead, many of the names seem to be derived from German names that were common in the village of Hamelin in the thirteenth century. In fact, the names in today's Polish telephone directories include Hamel, Hamler and Hamelnikow, all apparently derived from the name of the original village. Jakob và Wilhelm Grimm, known as the Brothers Grimm, drawing from eleven sources, included the tale in their collection Deutsche Sagen (first published in 1816). According to their account, two children were left behind as one was blind and the other lame so neither could follow the others. The rest became the founders of Siebenbürgen (Transylvania). Viktor Dyk's Krysař (The Rat-Catcher), published in 1915, retells the story in a slightly darker, more enigmatic way. The short novel also features the character of Faust. The Pied Piper (ngày 16 tháng 9 năm 1933) is a short animated film based on the story, produced by Walt Disney Productions, directed by Wilfred Jackson, and released as a part of the Silly Symphonies series. It stars the voice talents of Billy Bletcher as the Mayor of Hamelin. Van Johnson starred as the Piper in NBC studios' adaptation: The Pied Piper of Hamelin (1957). The Pied Piper is a 1972 British film directed by Jacques Demy and starring Jack Wild, Donald Pleasence, and John Hurt and featuring Donovan and Diana Dors. In 1986 Jiří Bárta made an animated movie The Pied Piper based more on the above-mentioned story by Viktor Dyk; the movie was accompanied by the rock music by Michal Pavlíček. In 1989 W11 Opera premiered Koppelberg, an opera they commissioned from composer Steve Gray and lyricist Norman Brooke; the work was based on the Robert Browning poem. Maythil Radhakrishnan's 1995 short story 'Sangeetham oru samayakalayanu' (Music is a Time-art) revolves around a Sanitary Inspector's assumption that the Pied Piper was none but the plague that killed uncountable numbers in 14th century Europe. China Miéville's 1998 London-set novel King Rat centers on the ancient rivalry between the rats (some of whom are portrayed as having humanlike characteristics) and the Pied Piper, who appears in the novel as a mysterious musician named Pete who infiltrates the local club-music scene. The cast of Peanuts did their own version of the tale in the direct-to-DVD special It's the Pied Piper, Charlie Brown (2000), which was the final special to have the involvement of original creator Charles Schulz. Demons and Wizards' first album, Demons and Wizards (2000), includes a track called "The Whistler" which recounts the tale of Pied Piper. Terry Pratchett's 2001 young-adult novel, The Amazing Maurice and His Educated Rodents, parodies the legend from the perspective of the rats, the piper, and their handler. The 2003 television film The Electric Piper, set in the United States in the 1960s, depicts the piper as a psychedelic rock guitarist modeled after Jimi Hendrix. 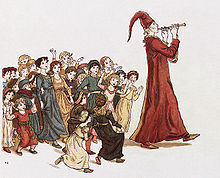 The Pied Piper of Hamelin was adapted in Happily Ever After: Fairy Tales for Every Child where it uses jazz music. The episode featured Wesley Snipes as the Pied Piper and the music performed by Ronnie Laws as well as the voices of Samuel L. Jackson as the Mayor of Hamelin, Grant Shaud as the Mayor's assistant Toadey (pronounced toe-day), John Ratzenberger và Richard Moll as respective guards Hinky and Dinky. The Pied Piper, voiced by Jeremy Steig, has a small role in the 2010 Dreamworks animated film "Shrek Forever After". In the anime adaptation of the Japanese light novel series, Problem Children Are Coming from Another World, Aren't They? (2013), a major story revolves around the "false legend" of Pied Piper of Hamelin. The adaptation speaks in great length about the original source and the various versions of the story that sprang up throughout the years. 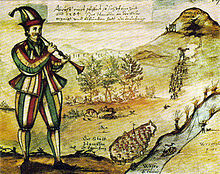 It is stated that Weser, the representation of Natural Disaster, was the true Piper of Hamelin (meaning the children were killed by drowning or landslides). In 2015, a South Korean horror movie title The Piper was released. It is a loose adaptation of the Brothers Grimm tale where the Pied Piper uses the rats for his revenge to kill all the villagers except for the children whom he traps in a cave. The short story "The Rat King" by John Connolly, first included in the 2016 edition of his novel The Book of Lost Things, is a fairly faithful adaptation of the legend, but with a new ending. It was adapted for BBC Radio 4 and first broadcast on ngày 28 tháng 10 năm 2016. In the American TV series Once Upon a Time, the Pied Piper is revealed to be Peter Pan, who is using pipes to call out to "lost boys" and take them away from their homes. Wandrelief mit Sagenmotiv Der Rattenfänger von Korneuburg am Kindergarten Hetzendorfer Straße 57 in Wien-Meidling. ^ Anees (ngày 3 tháng 1 năm 2015). “Was the Pied Piper of Hamelin real?”. UK: Ary Services. Truy cập ngày 6 tháng 6 năm 2015. ^ “Deutungsansätze zur Sage - Ein Funken Wahrheit mit einer Prise Phantasie”. Stadt Hameln. Truy cập ngày 29 tháng 12 năm 2017. ^ a ă “Kirchenfenster”. Marktkirche St. Nicolai Hameln. Truy cập ngày 29 tháng 12 năm 2017. ^ "Reader's Digest the Truth about History: How New Evidence is Transforming the Story of the Past", p. 294, Reader's Digest Association, 2004. Truy cập ngày 13 tháng 10 năm 2013. ^ a ă Shiela Harty, "Pied Piper Revisited", Essay published in: David Bridges, Terence H. McLaughlin (eds), Education And The Market Place, Routledge, 1994, p. 89. ISBN 0-7507-0348-2. ^ “Der Rattenfänger von Hameln - Wussten Sie schon, dass der Auszug der Kinder in historischen Quellen belegt wird, die Geschichte von den Ratten dagegen eine Erfindung des 16. Jahrhunderts ist?”. Museum Hameln. Truy cập ngày 29 tháng 12 năm 2017. ^ D. Wolfers M.B. Sydney, D.T.P.H., A PLAGUEY PIPER, The Lancet, Volume 285, Issue 7388, pp. 756–757, ngày 3 tháng 4 năm 1965. Truy cập via ScienceDirect ngày 13 tháng 10 năm 2013. ^ Hüsam, Gernot (1990). Der Koppen-Berg der Rattenfängersage von Hameln ("The Koppen hill of Pied Piper of Hamelin legend"), pamphlet published by Coppenbrügge Museum Society. ^ Stuart J Borsch, The Black Death in Egypt and England: A Comparative Study, University of Texas Press 2005, ISBN 0-292-70617-0. ^ Wolfgang Mieder, The Pied Piper: A Handbook, Greenwood Press, 2007, p. 67. ISBN 0-313-33464-1. Truy cập ngày 3 tháng 9 năm 2008. ^ “Climate probably stopped Mongols cold in Hungary”. Sciencenews. Truy cập ngày 14 tháng 1 năm 2010. ^ "The Legend of the Pied Piper" Lưu trữ ngày 19 tháng 8 năm 2011, tại WebCite, Rattenfängerstadt Hameln. Truy cập ngày 3 tháng 9 năm 2008. ^ Ursula Sautter, "Fairy Tale Ending." Time International, ngày 27 tháng 4 năm 1998, p. 58. ^ Twist in the tale of Pied Piper's kidnapping by Imre Karacs, Independent, The (London), ngày 27 tháng 1 năm 1998. Truy cập ngày 25 tháng 6 năm 2017. ^ Eastman's Online Genealogy Newsletter: A Weekly Summary of Events and Topics of Interest to Online Genealogists, Vol. 3, No. 6, ngày 7 tháng 2 năm 1998, Ancestry Publishing—Pied Piper of Hamelin. Truy cập ngày 5 tháng 9 năm 2008. ^ Fanny Rostek-Lühmann. “Der Rattenfänger von Hameln”. Hinrich Lühmann. Truy cập ngày 14 tháng 1 năm 2018. ^ “Pied Piper – Verses”. Lancsngfl.ac.uk. Truy cập ngày 27 tháng 7 năm 2010. ^ Sibelan E.S. Forrester. “Review Of "The Ratcatcher: A Lyrical Satire" By M. Tsvetaeva And Translated By A. Livingstone”. Swarthmore College. Truy cập ngày 29 tháng 12 năm 2017. ^ “The Pied Piper (1933)”. IMDB. Truy cập ngày 29 tháng 12 năm 2017. ^ “The Pied Piper (1972)”. British Film Institute. Truy cập ngày 29 tháng 12 năm 2017. ^ “1989 – Koppelberg – About”. W11 Opera. Truy cập ngày 5 tháng 4 năm 2017. ^ “Happily Ever After: Fairy Tales for Every Child”. IMDB. Truy cập ngày 29 tháng 12 năm 2017. ^ Diomeda (ngày 2 tháng 3 năm 2013). “8. It Seems that a Great Disaster will Come with the Playing of a Flute?”. Problem Children are Coming from Another World, Aren't They?. Mùa 1. ^ “The Piper (2015)”. IMDB. Truy cập ngày 29 tháng 12 năm 2017. ^ “Once Upon a Time (TV series)”. Wikipedia (bằng tiếng Anh). Ngày 20 tháng 11 năm 2017. Ullrich Junker: Rübezahl – Sage und Wirklichkeit. [In:] „Unser Harz. Zeitschrift für Heimatgeschichte, Brauchtum und Natur". Goslar, December 2000, pp. 225–228. Aleksander R. Michalak: Denar dla Szczurołapa, Replika 2018. D. L. Ashliman of the University of Pittsburgh quotes the Grimm's "Children of Hamelin" in full, as well as a number of similar and related legends. A Translation of Grimm's Saga No. 245 "The Children of Hameln"
Uri Avnery, "The Pied Piper of Zion", Gush Shalom website. ngày 30 tháng 1 năm 2016. About Israeli Prime Minister Binyamin Netanyahu and contemporary Israel.